The previous month or so I was getting kind of worried about the quality of time I’d been spending with Liron (I should say lack of quality time). She is thoroughly independent and self-directed which can be cool, but I was thinking there had to be some activities that I could suggest and follow through with to engage her better. After all, I don’t want her just running around stimming left and right! So it was to my great delight when about 3 weeks ago she hopped off her bar stool (her snacking perch) where she was watching me cook, to actually ask questions and help! I hadn’t been baking much lately, but I picked up a book called Chocolate and Zucchini at a local used bookstore. (Yes, I linked you to the author’s blog. And I encourage you to check it out and explore more about her.) So when a tub of plain whole-fat yogurt guiltily kept staring me in the face, knowing it was only a matter of time til it went bad, I decided to make yogurt cake from said cookbook. And so it was! The cake was yummy, simple, not obnoxiously sweet, easy, and FUN! I decided on the heels of this activity (where Liron helped sift, measure and stir) we would bake something the following week. So I asked her for ideas. 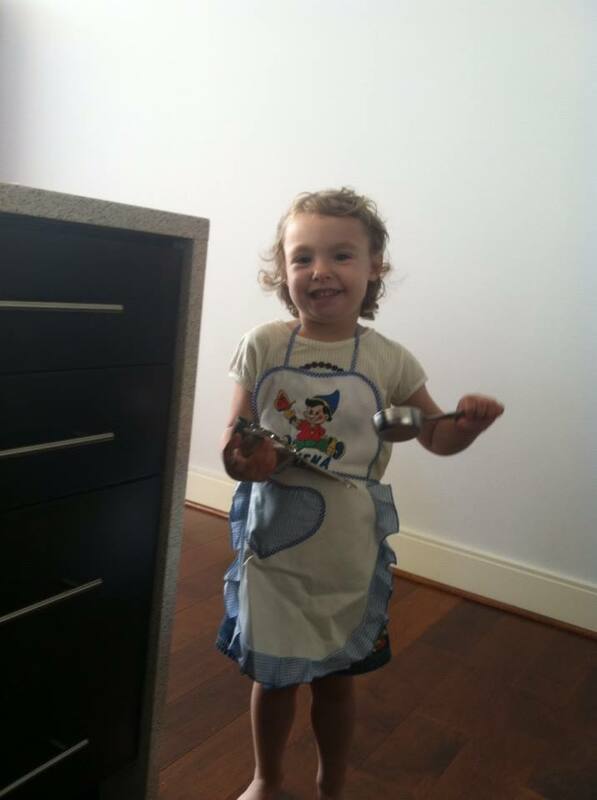 Me: Liron what should we bake next? 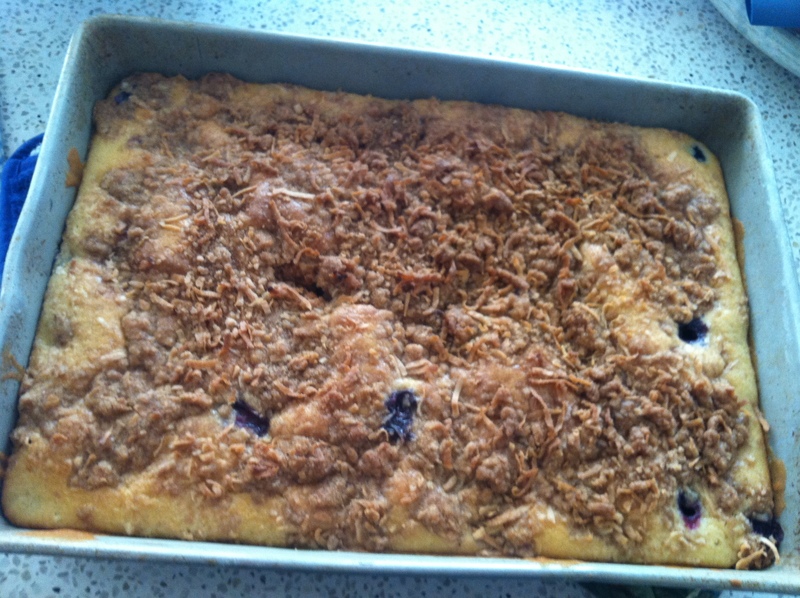 I went on Epicurious and came up with this winner – blueberry coffee cake, pictured below. The following week she requested raspberry cake. 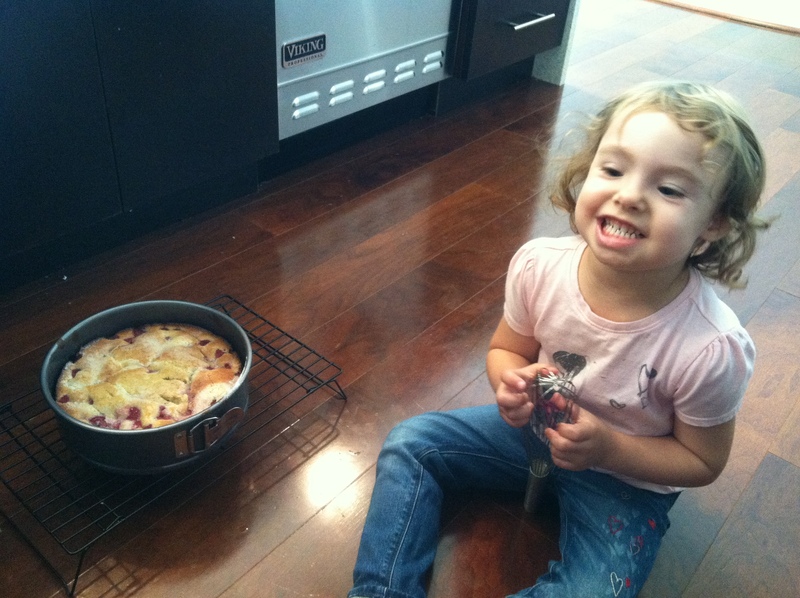 Back to Epicurious for this – Raspberry Cake with Marsala, Crème Fraîche, and Raspberries, pictured below with cooking assistant. WIN! We had company come that night and I can tell you it was a big hit (though not cheap given the cost of raspberries these days). So there you have. We have a tasty new hobby! Fun, and wow, she has good taste! I should remember to give my kids things they can help do when making dinner. 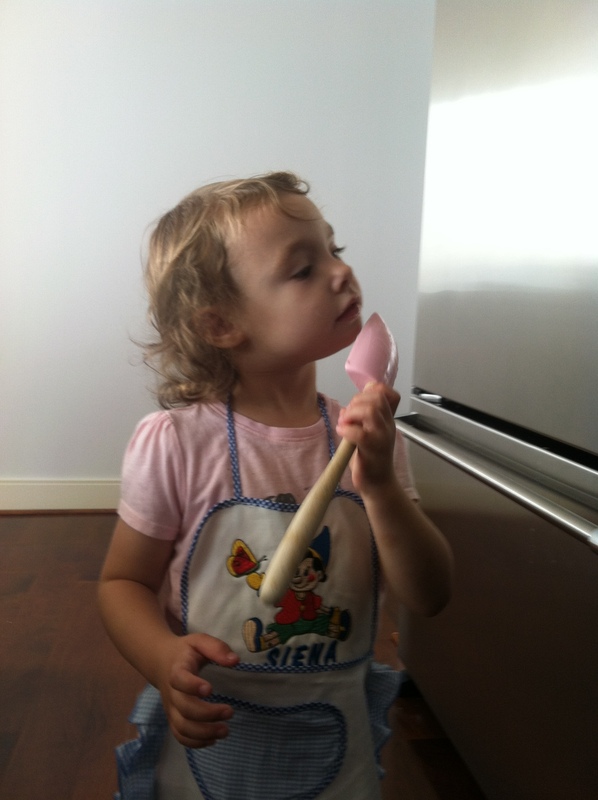 My daughter likes helping in the kitchen, but it’s easy and faster to do it myself (duh…). She does have good taste, but to be honest, even though she liked the blueberry and raspberry cakes, she’d take an ice cream sandwich over either one I think. I’m just glad she enjoys the process of creating something. Cooking dinner is another story. She treats vegetables like the plague and unless it’s pizza, meatballs or some type of nugget she could care less.